Raising funds through the qualified institutional placement (QIP) route no longer entices companies. Though it is a faster and time-saving option for listed companies in India to garner funds, the number of issues each year has been declining from its peak in 2009-10. As the chart shows, ₹ 43,968 crore was raised via this route in that year and the number of issues stood at 67, the highest in the history of QIPs in India. The Indian equity market was on fire in that period, with the Sensex giving returns of 80.5%. 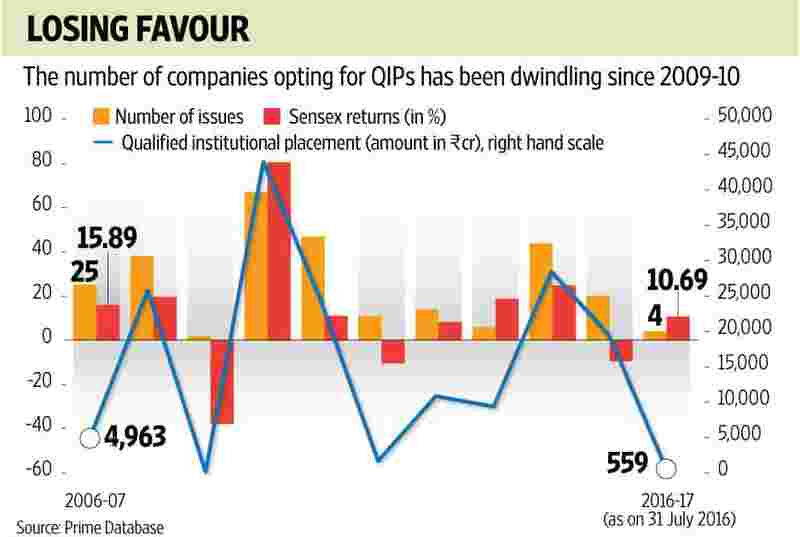 This year, up until July, only four QIP issues have happened, according to data from primary market tracker Prime Database. Concerned by this drastic fall, the Securities and Exchange Board of India (Sebi) is mulling steps to revive QIP activity. As reported by Mint, the market watchdog last week met investment banks to discuss what can be done to boost more activity in the product.